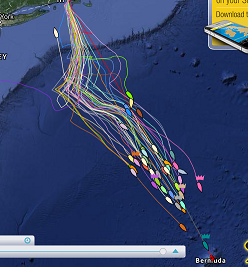 En Route to Bermuda- June 22, 2015: As of 1300hrs EDT on Monday June 22 Mischievous, the scratch (fastest) boat in the fleet was still leading the fleet. As she rockets down the rhumb line to Bermuda at 10-11kts, she keeps clicking minutes off of her ETA in Bermuda. Her estimated arrival time is just after 1900 ADT in Bermuda. The sleek white sloop is skippered by Charles Cahill is the ‘big boat’ in the Mass Maritime Academy stable. She is being sailed by a youthful crew of cadets. Much of the race she was also the leader of Class A on corrected time, but now is 4th. 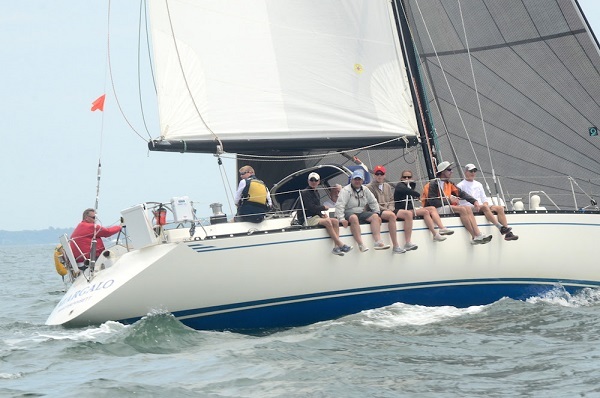 Chip Johns’ Baltic 58 Margalo now stands first in Class A on Corrected time according to Yellow Brick data. Defiance the Swan 56 is second and the J46 Ariel has moved into 3rd. Two boats from Class A have retired. Kiva an Aerodyne 47 ripped her mainsail and Free Range Chicken had a rigging failure. The US Naval Academy boats are dominating Class B. Swift NA11 skippered by Kyle Briggs has been a hot performer for the past year and in spite of being the lowest, slowest handicapped boat in Class B has punched her way into the corrected time lead. Swift also leads the Celestial Navigation Division. Defiance NA23 skippered by Jared Velaske is 2nd and Integrity NA22 skippered by Tom Wester is 3rd. Legacy V retired after one of her crew died aboard of natural causes. Bill Fasnacht apparently had a heart Attack. His crew mates could not revive him after an hour of CPR. The lowest, slowest handicapped boat in Class C, Silhouette, a Cherubini 44 skippered by David Caso, is also the corrected time leader. Standing 2nd is Black Mallard a Cardinal 46 skippered by Tracy Day McRoberts, the top female skipper in the race. Attitude. A Beneteau 423 skippered by Shawn Dahlen is 3rd. The smallest boats, those in Class D, are led by TI an Alden Mistral 36 sailed by Gregg Marston. Following in 2nd is Trust Me the Moody 47 skippered by Jeff Dowling. In 3rd is the Free Spirit sailed by Thomas Stokes. Is Fearr Cara has retired. Spirit of Bermuda, the Bermuda Sloop Foundation’s sail training vessel chartered by Jim Butterfield, is in a strong position compared to past Marion Bermuda Races. She is standing 4th for the line honors position. She is flying on a reach right down the rhumb line sailing at over 10kts VMG to her home port. By Tuesday, winds 75% down the course where most of the fleet should be are predicted to be westerly and then back more to the southwest.